Stanley Tools has a nifty all in one car gadget perfect for anyone & it’s on sale on Amazon. 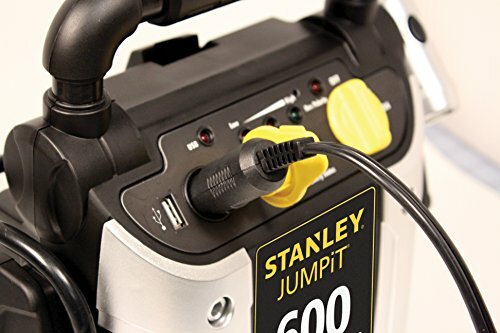 Check out the STANLEY 300 Amp Jump Starter: 600 Peak/300 Instant Amps today for only $38.92 (list $64.99) from Amazon! It is a Portable Battery Jump Starter that can also be used to charge your USB powered electronics in an emergency. Plus, it has an LED light included for night use. This is indeed a handy item to have. Check out all of the recent Amazon deals here! This would be handy for when you lose power. Also, many new cars have computers that can be damaged when jump-starting another car’s battery. This Stanley 300 Amp Jump Starter lets you be a good Samaritan without damaging your own car. Amazon Prime members get FREE 2-day shipping!! If you are not a Prime member, get FREE super saver shipping. Check out the Stanley Tools Portable Battery Jump Starter details below. Buy the STANLEY J309 Jump Starter: 600 Peak/300 Instant Amps from Amazon. Need other Tools and Equipment? Next articleNIVEA Men Power Refresh Body Wash (Pack of 3) Best Price!